There's a major regulatory change in the works and it’s causing a bit of anxiety for American employers. Behind this concern is a rule that the Department of Labor is in the process of finalizing. Once put into place, the new regulation will greatly expand the number of employees eligible for overtime pay. Reports indicate that the rule could be finalized as early as April or May of this year, and would likely go into effect shortly after. Under current law, workers who earn less than $455 a week (about $23,660 a year) must be paid time and a half if they work over 40 hours in a week. The DOL rule would more than double that threshold, meaning that employees earning under $970 a week ($50,440 annually) would also qualify for overtime pay. The salary threshold was first created as part of the Fair Labor Standards Act of 1938, and since then has seen periodic increases to keep pace with inflation (the last adjustment was in 2004). So why the change? When the threshold was originally put into place it covered 60 percent of workers; despite occasional updates, the current threshold applies to just 8 percent of today’s workforce. DOL argues that the new threshold will bring that figure back up to 60 percent, in keeping with the original intent of the law. 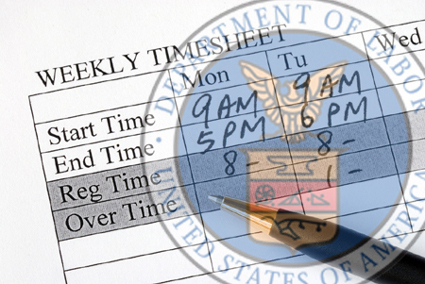 The goal of ensuring overtime pay for eligible workers is laudable, but there are some major drawbacks to DOL’s approach. For starters, the new salary threshold is more than double the current figure. While there is considerable support for increasing today’s outdated threshold the new levels are unprecedented, especially given low levels of inflation and flat, post-recession revenues since the last adjustment. The design and construction industry was one of the hardest hit by the 2008 financial crisis, and with architects still feeling its ripple effects the size of this increase could become a burden for firms within the industry. The rule is also likely to have a much greater impact on small businesses than their larger counterparts, a major concern given that the close to 80 percent of architecture firms employ ten or fewer people. For example, the new regulations would require that the salary threshold be automatically updated each year to reflect changes in inflation. In theory this makes sense, but in practice small firms that lack a dedicated, in-house accounting team will find themselves devoting more of their time and resources to compliance rules, only to see them change at the end of each year. One final concern is that the new salary thresholds would be applied nationwide via a “one-size-fits-all” approach that ignores regional differences in the cost of living. In fact, DOL’s proposed salary threshold is about $10,000 higher than California’s own threshold, and $15,000 higher than New York’s -- two of the highest-cost states in the nation. So what does this mean for AIA members? The rule’s impact is sure to be more acutely felt in certain sectors, such as retail and hospitality, than in the architectural field, but that doesn’t mean design firms will be left untouched. Even if every design professional in your firm is already earning more than the new threshold, there are likely support staff and others to consider (and whose weekly hours you might need to start tracking closely). With DOL expected to finalize the rule in the next few months, it’s important for design firms to start planning for the future and to make sure they’re not caught off guard when the changes go into effect.